If you are staying at a Disney resort, you can purchase a Refillable Mug for $13.99 + tax. The purchase of a mug, entitles the "mug holder" to free refills at their resort for the length of their stay. 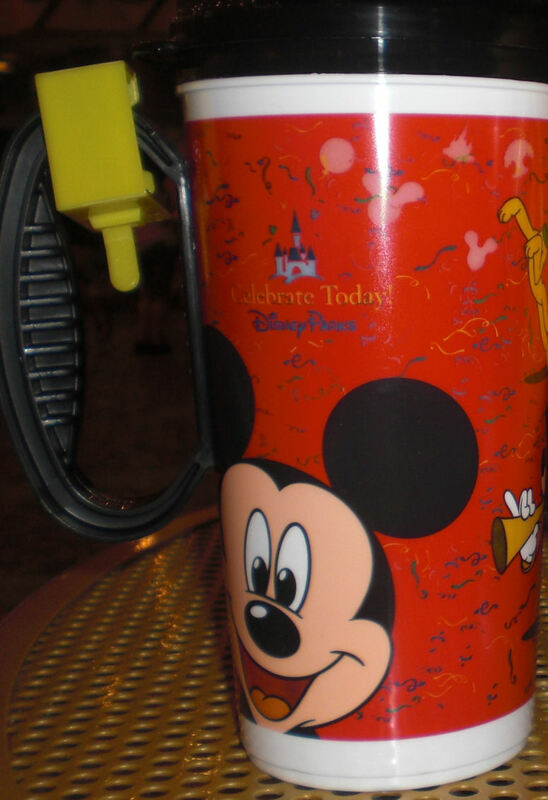 The mugs can be purchases and refilled at the resorts quick service dining location. Some resorts also have a second beverage station located near the pool. How big is it? The mug holds 16 ounces and is nicely sized to fit in a cup holder when you get home. Which drinks can I put in the cup? You can refill your mug with any fountain drink from your food court. You can also refill it with coffee or tea - but if you are a southern gal like me, be aware there is no proper sweet tea on property! Are there any drinks I can't put in the cup? Yes - Disney does not allow you to get free refills on milk and juice...and I would not expect the local barkeep to refill it with a frosty margarita, though I am sure many have tried! Can I refill at the parks? No. The mug can only be refilled at your resort. You can, however, fill your mug and head off to the parks with your mug in hand. Do I need to bring dish soap to clean my mug? No. Disney has a mug wash station near each fountain location. You can wash it before you refill. If you are worried about throwing a dirty mug in your park bag, just bring a gallon zip top bag from home. Then there will be no worries about an errant drip leaking onto your touring plan! Can I reuse my mug on my next visit? If you have ever been on a Disney bulletin board, you will find some crazy debates on this topic! The mug you purchase is to be used for your length of stay only. If you choose to bring it back with you on subsequent trips, you technically are stealing (but the mug police are not going tackle you on the spot). In fact, to follow the letter of the law, if you split your stay between 2 or more resorts, you have to purchase a new mug for each resort. I am pretty much stickler for following rules, but even I could sleep soundly reusing my mug in that case. Is it worth it? Probably the most asked question and most difficult to answer, as it is so subjective. Obviously, the longer your stay, the better value the mug is. From a dollars and cents perspective, you will be getting a mug that you can take home as a souvenir. It is not as good a quality of mug that you would buy in the parks, but it is more than "serviceable". (In terms of quality, think nice free give away offered by a radio station or store) At home, I would expect to pay $4-5 for the mug alone. At Disney, I would expect to pay twice that. As for the drink itself, you can expect to pay over $2 for each fountain drink at a resort. If you simply must start and end your day with a Diet Coke, your mug will quickly pay for itself. Also, if you expect to make regular use of your mug, consider requesting a room closer to your resorts quick service location. If you are staying at the sprawling Caribbean Beach Resort, for example it may not be worth a 10 minute hike to refill your mug! Is the mug on the Dining Plan? Yes. And no. If you are on the Quick Service or Deluxe Dining Plan, one Refillable Mug per person is included on your plan. If you are on the regular dining plan or paying out of pocket for meals, then you will have to pony up the cash to purchase a mug. Budget – Budget is probably the single biggest factor people weigh when considering a resort hotel. Wouldn’t we all love to stay in a 2 Bedroom Suite at Bay Lake Towers Deluxe Villas? And if you have saved your pennies for a splurge trip, this would be a fantastic choice! If your reality (like mine) is a little different, then there are many other resorts that will work with a budget. I am a big fan of the moderate level of resort. It gets the job done comfortably, and seems to be a nice compromise between the smaller, busier Value hotels and the pricier Deluxe hotels. While a splurge is worth it if it works with your wallet, I urge you not to break your budget on a hotel. While you will surely enjoy it while you are there, you may find yourself bitterly eating Ramen noodles for 3 months after you return. Transportation – If you are relying on Disney transportation to shuttle you from park to park then you must factor that into your hotel stay. All resorts rely on buses to get their guests around the world. In addition, you can choose a resort on the monorail for quick and easy access to the Magic Kingdom and Epcot. Fort Wilderness and Wilderness Lodge rely on ferries to shuttle passengers to the Magic Kingdom, so if you are not a fan of boats, consider another resort! The Port Orleans resorts also run regular ferries to Downtown Disney. Some resorts are within walking distance of a park, so you can bypass Disney Transportation all together! Location, Location, Location – If you are planning on spending every day in Animal Kingdom, the Downtown Disney area resorts may not be the best choice for you. If you have young children that have strict nap schedules, or if you plan to be in the Magic Kingdom or Epcot for most days of your stay, it may be worth splurging on a monorail resort. Theme – Disney resorts are synonymous with amazing themes! The details in some resorts are fascinating and worth exploring in their own right. While it is easy to let the theme rule your resort decision, I urge you to at least consider some more practical details first. That being said, when you can match the right theme to the right family it is just magic. It is that something extra that says “Disney” and keeps magic going day and night. Pool - The pool factor is one that I frequently dismiss, and I shouldn't. I come to Disney for the parks, a quick dip to cool off in the middle of the day if fine, but I can swim at home! For many kids, the pool is the highlight of their trip. If you have a longer stay, choose a resort with a great pool and make time to use it! A “resort day” mid week is a great way to recharge everyone’s batteries. Conversely, if you are a theme park nut, a less spectacular pool (or at least a room without a few of it) may prove less of a lure to your children. Bed Size – I love my husband. No, I absolutely adore him. But I would rather sleep on the floor than try to share a double bed with him (or my children for that matter!) To borrow the old break up line…"It is not you, it’s me!"... and it is true. I need room. I get hot. I toss and turn. I require at least a queen size bed if I have to share. If you are a picky sleeper, like I am, be sure to consider your sleeping arrangements before you book your trip. Room size – There is a decent size difference in the rooms in a Value vs. a Deluxe hotel. If you plan to be in your room to sleep and only sleep, then this may be less of a consideration. Just know that a family of four in a Value hotel for a week may redefine the term “family togetherness”! Outdoor Space – As I spent my last trip to the world sitting on the edge of the bathtub, trying to read a book, and waiting for my children to fall asleep, I found myself wishing for a little balcony or patio. It would have been wonderful to sit outside with the door cracked so I could hear the mandatory excuses for why they could not possibly go to sleep. It also would have been a great spot to drink my coffee and eat my granola bar while my husband was shaving and the kids were getting dressed. Next time – balcony! Amenities – Is it not a vacation without a spa? Is a sit down restaurant a must or will a food court suffice? Is a morning workout a must? Is a hot tub required at the end of a long day? Be sure to check the fine print and know what to expect before you check in! I encourage you to take some time to find the perfect resort for your family. I have found my greatest resource to be my friends. Don’t just ask your friends which resort they liked…ask WHY they liked it. The reasons they loved it may be reasons you won’t! They also may be able to communicate some “X Factor” that has been overlooked by the guidebooks that may click with you…after all they certainly know you better! What else do you consider? Leave a comment and share your thoughts! I have a new addiction (besides obsessively planning my next trip to Disney World). I am addicted to my iPod Touch. So addicted that I am trying to justify the purchase of an iPhone now that I have started working as a Travel Agent. Now I have a real need to check my email anywhere, right? You can imagine how happy I am when my obsessions intersect in the form of Disney Apps. From time to time I will review an app to help you decide it if it worth your time and money. I will start with a favorite: Disney World Dining. Not sure if the Dining Plan is a good call? Wondering how soon you will break even on your Tables in Wonderland Card? Need to make sure that your picky mother in law will find something she will enjoy for dinner? 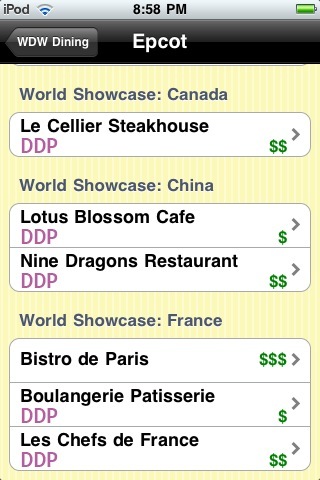 Then the Disney World Dining (WDW Dining) app is for you! 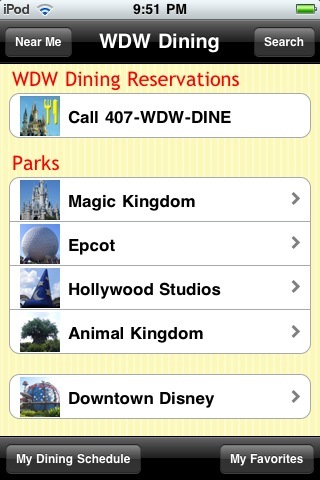 Disney World Dining is an easy to use, intuitive app that lists menus for all restaurants at Disney World. It is compatible with the iPhone and iPod Touch no 3G or wi-fi connection is required to access the data, making it perfect for Touch users to use in the parks. The app is available in the App Store for $1.99. When you open the app you are presented with a list of each park and resort. Within each park, the restaurants are nicely organized by land, making it easy to locate the restaurant you are looking for. 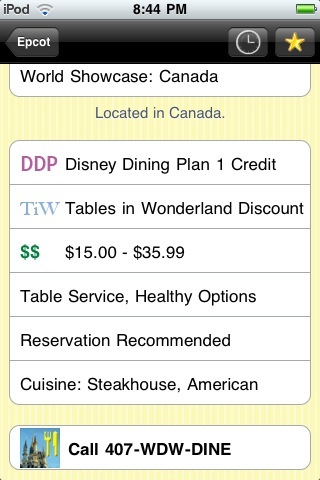 When you drill down to a specific restaurant page there is a brief summary of the restaurant, a photo, and some key information, including whether the restaurant is a table or counter service, if the Dining Plan and Table in Wonderland card is accepted, and the average entree price. You can then further drill down to specific menus. The menu often includes a brief description as well as the price. I am not including screen shots of the actual menu, as I don't want to land myself in any trouble! From the main restaurant screen, you can flag a restaurant as a favorite which will include it on the "My Favorites" tab located on the Home Screen. This allow quick access for future review. Also from the Main Restaurant screen you can access the Scheduler Function. The Scheduler allows input of ADR information, including Date, Time, Confirmation Number and Party Size. 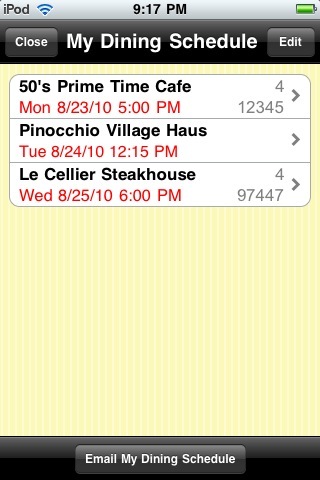 All scheduled events will be included in the "My Dining Schedule" screen tab located on the Home Screen. Once your schedule is complete it can be emailed directly from the app. A search function is also available to find restaurants, but the great organization of the restaurants makes it almost superfluous. GPS Functionality will show restaurants nearest your location iPhone users have additional functionality of being able to call WDW-DINE directly from the app. Overall, this is a great little app. There is a significant amount of information available right at your fingertips, it is well organized and easy to use. Assuming the developer maintains the app with menu updates, this app is very worth the price. Carnival Head over there to see more great posts like this. It is every parents fear. Just the thought of loosing a child in a busy theme park is enough to make any parent's heart pound and palms sweat. Our daughter was a very independent 4 year old on our last visit to Disney World and I was terrified of loosing my grip on her little hand after a parade and being separated as the crowds surged. Fortunately, there are a few common sense steps you can take to help keep your kids safe. Label them - If you read my previous blog entries, you know I am a fan of my label maker. When it comes to my children I take it a step further. I ordered a dog tag for each child...not military...canine. I put their names on one side and my name and cellphone number on the other. I attached the tag to their little shoes. This insured that my "late talker" would not need to try to communicate any information should she get lost, and my fearful 4 year old would not have to try to remember our contact information when she was already scared. You could also use an id bracelet, or, if your child is a little older a Sharpie and their little forearm will work just fine. Match them - I am lucky on this front. I have 2 little girls that love to coordinate their outfits. If can find a matching outfit for them to wear to a park, pool, or playground I will definitely have them wear it. If matching outfits are not an option, a shirt in a similar color is a good alternative. It really helps you locate your children in a crowd. Scanning a crowd or an play area is much easier when your eye is looking for only one color. If one child gets separated, you won't be put on the spot trying to remember what they put on that morning...you can show any cast member what your other child is wearing. Photograph them - What else are you going to to when you are waiting for the bus or for rope drop? Snap a quick picture as you start the day and then you have a current picture of your child in the outfit they are wearing. Hopefully, this will be photograph you will never need. Teach them - Talk about what they should do if they get lost. Show them what a cast members name tag looks like and let them know that is a good place to start if they need help. If a cast member is not nearby or if they are uncomfortable asking a cast member tell them to ask a mommy. Most mommies will drop everything for a child in need and will not leave them until they are back where the belong. If your child is not especially verbal, be sure you show them where your contact information is located. Corral them - A stroller is great for keeping a little one (or even a not so little one safe). Encourage your child to use a stroller for as long as you can safely stuff them in one. If your child must walk, have a hand holding rule. If your child is young, or prone to go darting off consider a backpack type tether. I must admit that I hated the thought of a "leash" before I had children. They are children not dogs. Then I realized I put my dog on a leash for the sole purpose of keeping her safe...suddenly the "leash" did not seem like such a bad idea. I promise if you have your child on a leash I will not judge you...unless you are jerking him around like a misbehaving pup...then I will judge you...HARSHLY. Drill them - A great thing to teach your child is to stay put if they get lost. You can quickly back track your last steps and find them. Practice "losing" a parent. Once you notice Daddy is missing you can back track your steps and find Daddy waiting calmly. When you discover him, he can confirm he was scared, but knew you would be back for him. Have him reiterate that was staying right where he was when he realized he was lost while he was looking for a cast member or a mom to help. Prepare them - Tell them to answer your calls. This sounds totally ridiculous, but it is absolutely true. I remember a little boy named Michael getting lost on the beach. His mother became frantic. The entire beach moved into action. People formed human chains to "drag" the ocean floor. I can still remember the chilling screams of his mother as she called his name. After about 20 minutes we really began to fear the worst. About a half hour into the ordeal Michael was located. He was sitting in a tidal pool about 20 feet from his mother. He heard her frantic screams and ignored them. Why? He thought he was in trouble. He figured if he just laid low for a little while she would cool off and he would not be in trouble anymore. Tell you kids they will not get in trouble.....just answer your calls! Should the worst happen and you find your self separated from your child, take a deep breath and don't panic. Hopefully, they will remember the stay put rule and if you back track a few steps you will find them waiting for you - perhaps never even knowing they were lost in the first place. If you cannot find your child within a minute, notify a cast member immediately. Cast members deal with lost children every day and they are pros at handling the situation. Children who have misplaced their parents are taken to the Baby Care Center or Guest Relations. A cast member will show you the way. If you have two adults, send one to the Baby Care Center and have the other stay in the general vicinity. Also, be sure to have you cell phone in hand. Hopefully, whoever locates you child will spot the id tag and call you immediately. When it comes to keeping track of your children I am a firm believer that an ounce of prevention is worth a pound of cure. Hopefully, these tips will help keep your kiddos with you, or at least speed up the the reunion should you get separated. Please "Like" us on Facebook! 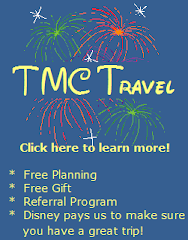 Just click on the "Like" icon in the upper right hand corner of this blog, or find us at www.facebook.com/tmctravel. The Not-So-Great-Resort-Debate: On or Off Property? I must admit to being a big fan of staying on property, in fact, I have a big bias in that direction. There is something comforting about being in a secure little Disney bubble. It is comfortable. It is familiar. It is convenient. Extra Magic Hours - Extra Magic hours give you extra time in the parks. At least one park a day will either open one hour early or stay open three hours late for resort guests. While the park with the Extra Magic hours in the morning tends to be a lot busier the entire day, the evening Extra Magic hours do not tend to draw the same crowds. If you have a Park Hopper ticket, it may be a good plan to take advantage of the early opening at one park and and then move on to a less crowded park for the remainder of your day. Disney's Magical Express - The Magical Express is one of the best deals around. You say goodbye to your luggage at your local airport (hopefully for only a few hours!) and hop on an Orlando bound plane. When you land, just follow the signs to the Magical Express buses, check in, and you will be whisked away to your hotel. No baggage claim or car rental necessary. Your bags will magically appear in your room a few hours later! Just remember to carry on anything that you think you may need within a few hours of landing... important medications, park tickets, sunscreen, comfy park clothes or a bathing suit would all be good choices! Free Parking - All resort guests can self park free at resorts and parks. If you drove your own car, or rented one when you arrived, you can save $14 per day in parking fees by staying on property. If staying off property, be sure to add your hotel's parking fee, if any, to your theme park parking free to get your total daily parking fee. Advanced Dining Reservations - As a Disney resort guest you get an additional perk when making your ADR's. Instead of making your reservations 180 days in advance for each reservation (calling every day for several days in a row) you can make all of your reservations at one time, 180 days from your check in date. Disney calls this the 180 day +10 plan. You can make one call and make your reservations for the next 10 days of your trip. 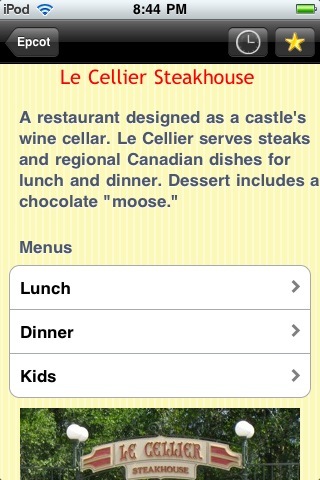 This can give you a 190 day window for some reservations - a HUGE advantage if you are trying to book the hard to get Le Cellier or Cinderella's Royal Table! Disney Transportation - Disney transportation is really pretty cool. Yes, sometimes there can be quite a wait if you are coming or going at a busy time. Yes, it can be crowded. And there is certainly nothing more frustrating that watching a loaded bus take off for the Magic Kingdom just as you breathlessly arrive at the bus stop! Overall, Disney transportation is a good thing. It is amazingly efficient, free, and will get you where you need to go in a reasonably timely fashion. Put away your road maps and don't worry about telling every one in your party where you parked in hopes someone will remember. Just hop on a bus, boat, or monorail, relax and review the first few items on your touring plan so you are ready to hit the ground running when you arrive! Key to the World Card - Is it a room key? A park ticket? A credit card? Why it is all of the above! It is so nice to have everything on one card. If you do not want to allow your children charging privileges just let the front desk know when you check in. Also, it is a good idea to have a "Keeper of the cards" in your party. Hand over your card after you enter the turnstile and then send that person off at a brisk pace to obtain a Fastpass for everyone in the group while everyone else walks at a relaxed pace to the first attraction. Package Delivery - No need to haul your purchases around the parks all day or worry about how you are going to keep your newly purchased goodies dry as you zoom down Kali River Rapids. Just ask that your package be delivered to your resort gift shop. No fuss no muss! Dining Plan - If you purchased a package deal for your travel, you have the option of taking advantage of the Dining Plan (or it's Quick Service and Deluxe) cousins. The dining plan is easy to understand and is very convenient. If you are smart about how you spend your credits, it will also save you a lot of money. It is also nice to have a pretty good idea of what your food costs will be before you ever arrive. Refillable Mugs - If you are a Coke addict...and I do mean Coca Cola...then a refillable mug may be right up your alley. Purchase a mug at your resort for around $14 and you can get as many refills at your resort as you wish. Grab a drink as you head out to the parks for the day and another when you come in for a break, and by all means bring that mug with you when you head out to the pool! The longer your stay, the more cost beneficial your mug will be. Now you have an excuse to stay a few more days! The best part about the refillable mug is that it is will fit nicely in your suitcase and will bring back all of the fond memories of your trip every time you use it. It is affordable...or not! - If you must adhere to a strict budget or if you have saved for a splurge there is a hotel for you. Child Care - It's a vacation for Mom and Dad, too! Stash the kiddos at one of the kids "clubs" offered by some hotels and enjoy an evening out. It is a bit expensive, but can you really put a price on a romantic stroll around the World Showcase after Illuminations? Or a peaceful and quite dinner at Victoria and Albert's? It will be a fun night for all. Freedom to separate - You child may be old enough to do some exploring on their own, but not old enough to drive your rental car. Your toddler may need a nap, but your older child is just dying to see the parade. Staying on property and using Disney transportation allows everyone in your group to come and go as they please. It is just cool. - Enough said! Well, since I said this is a debate about staying on or off property, I should probably mention some benefits to staying off property. Cost - While there are a range of price points for Disney hotels, you can almost certainly find a less expensive hotel off property. Even if you factor in rental cars and parking fees, you may still come out ahead by staying off property. You could also find a posher hotel with better amenities for the same price that you would spend on a Disney hotel. Car - Having a car can be nice. You can get around on your own schedule. Want to head to the outlet mall for some cheaper souvenirs? Need to stock up on some bottles of water at the grocery store? Need some bandages for that blister on your foot? It is nice to be able to hop in your car and take off. Convenient for other Day Trips - If Disney World is part, but not all of your Orlando vacation, it may be more convenient to stay off property. I love my label maker. I love it so much I photographed it...with flowers. So why does my label maker deserve a spot on a Disney blog? Because it is a great way to make sure you take home everything you bring with you! Disney has an amazing lost and found department. Can you imagine how many pairs of sunglasses a day are turned in? From what I understand Disney will make every effort to return lost items to their rightful owner, so why not make it easy for them to do so? Or for that matter, maybe the Good Samaritan who finds whatever you have lost will take the time to return it to you...if only they knew how. Enter The Label Maker...insert dramatic music here. I use a Brother P-touch that I have had for several years. I bought it after my daughter was born to label the multitude of sippies, snack containers, jackets, diaper bags and all of the various items that I had to haul everywhere. (If you want to get a Mommy-to-be a gift she will really use, think label maker!) You can find similar models at your local office supply, Target, or Walmart. I prefer to use the laminated labels because they stay on quite nicely - even in rain or the dishwasher. When I head to the World, I label anything that I would like returned if lost. I label many things before we leave and I even tuck some extra labels in an envelope so I can tag things on arrival. My husband joked that if he stood still long enough I would slap a label on him! My label maker will allow me to print 2 lines in a small font. I put my name on the top line and my cell phone number on the bottom line. Then I just peel and stick! My kids. But that is another post all together...stay tuned! Park Tickets - In addition to my name and cell, I also label who the ticket actually belongs to. It is a good idea to take a photo of all of the numbers on your ticket in case you need to get a new one issued quickly. Photopass - I hate to think of how many family photos may be lost because a photog switched photo passes. It is also a good idea to take a picture of the back of your Photopass card. Cameras - Video and Still. I decided to leave my labels on even after I returned home. It has come in handy more than once! Cell Phones - I put my name and cell on my hubby's phone and his name and cell on mine. Luggage -I use an easily identifiable luggage tag and then just slap my label on it. No worrying about ink running in a rain shower. It is also a good idea to find a luggage tag that hides your address. No need to advertise that you are not home! Strollers - I use the another easily identifiable luggage tag. Also, a splashy ribbon tied to the handle makes it easy to spot among the multitude of identical strollers. Park Bag and some contents - I label the first aid kit, skip the ponchos. I have never lost anything in the parks, but with my handy-dandy label maker, I feel like I at least have a fighting chance of getting my lost items back! Should you loose something at Magic Kingdom, head over to City Hall. If you are at Epcot go to the Entrance Plaza. At DHS or Animal Kingdom Guest Services is the place to go. If you realize you have lost something after you have already left the park, call (407) 824-4245 for assistance. Little Susie absolutely must ride Dumbo and it's a small world. Johnny must ride Big Thunder Mountain Railroad and Splash Mountain. Dad wants to see if Space Mountain was as fun as it was when he was a kid. Mom, who still feels a little guilty for taking the kids out of school, wants to make sure the Hall of Presidents is on the list. And did I mention that they must get to lunch at the Crystal Palace at 11:50, they all want to watch the parade, and they must head back to the resort by 3:45 for a little rest before dinner? Sound familiar? Then it is time to call RideMax to the rescue! RideMax is a downloadable internet software program that will create detailed custom itineraries based on user input. RideMax claims to save its users a lot of time by moving people through the more crowded attractions at off peak times as well as managing FastPass distributions. Based on my experience, I agree! RideMax programmers have studied the crowd calendars, wait times and touring patterns of the parks for many years and have come up with some fancy algorithms that will optimize your daily agenda - what ever it is. You simply input your wish list for the day and let RideMax do the rest. Once RideMax runs its calculations you will be presented with a minute by minute agenda that you can print out and tuck in your pocket. I never over promise and under deliver. With kids, that is hands down the biggest benefit. RideMax will give you a very clear picture of what is feasible to do based on the day that you are trying to do it. This is also what makes RideMax invaluable for park novices. It ends the "What do you want to do next?"... "I don't know, what do YOU want to do next?" conversation for Mom and Dad while each child is lobbying for their own agenda. You already know what is next - it is right there on your list! You know how long of a wait you can expect on a particular attraction. Ideally, this wait will be much shorter than if you did not use RideMax, but it is helpful to know in advance if you should plan on giving little Susie some Cheerios to munch on while you wait. You can make sure that everyone's must do's are on the list, present and accounted for. FastPass Management - Will you send a runner to get your FastPasses? Are you OK with riding outside of the posted return time? (Disney does allow this, but does not post this information) When should you get your next FastPass? RideMax considers all of these variables when creating your plan. Touring Speed - Are you a family of speed walkers or does the stroller slow you down? Either way, RideMax has you covered. Customize your arrival and departure time as well as build in meal and rest breaks. What if scenarios - You can run multiple itineraries per day and choose which one suites your family best. If there is an attraction you want to ride first and RideMax has it listed later in the day, simply do what you want to do first and begin have RideMax schedule itinerary for the rest of the day starting at attraction. (Otherwise your walking time will be calculated from the entrance. Get the best of both worlds. Use Ride Max to plan your morning and afternoon itinerary as this is when you will see the biggest benefit. Leave your evenings more open to wander and explore. Don't go "Commando Disney" the entire day or you will be exhausted, you will miss a lot of really cool stuff, and your family will hate you. If your plan is working - stick with it! The first morning we used the plan, my husband wanted to veer from the schedule. "Why don't we just do this now? I mean we are right here!" If we had done that minor attraction right then instead of later in the day we would have spent much more time in line overall, as the crowds tend to pick up as the day moves on. Trust them...they know what they are doing! Thus ends my RideMax testimonial...and I did not even get paid by them - not even in a free month of software. If you want to check it out further go to RideMax. A 90 day subscription to the Disney World program costs only $18.95. With all that you have already planned to spend on hotel, ticket, and food you might as well spend an extra $20 to make sure you can enjoy it to its fullest! Is your child an adventurous eater? Does a kids meal leave your child wanting more? Does your child covet your (or their siblings) grown up dessert? If you answered yes to anyone of those questions, listen up! If you are taking advantage of Free Dining via PIN Code or seasonal promotion consider buying your child an adult ticket. Isn't that way more expensive, you ask? Well, yes it is more expensive, but not by much! If you are planning on purchasing a 3-10 day Magic Your Way Ticket the price difference between an adult and a child ticket is only $33. Not $33 per day...but $33 total! Pretty neat, huh? Your child will have many more menu options and you have a fabulous dessert to use as bribery through out the day! Of course, you can purchase an adult ticket for your child even if free dining is not offered, but you will have to pay the much higher adult rate for the dining plan on top of the extra cost of the ticket. It could still be a good deal if you have a 9 year old with a huge appetite...just not as cheap as well...free! Remember, that this only works one way. you can make your 3-9 year old an adult, but you cannot make your 10 year old a child. If you have a 10 year old picky eater that eats like a bird and will only eat off the children's menu, you are still on the hook for an adult ticket. 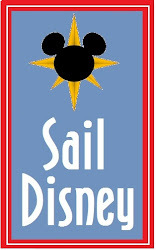 Free Dining books up fast, so if you are visiting the Mouse this fall, start making those ADR's today!